b) By preventing already corrupt 'rulers' from receiving bribes (negative solution). I've noticed that a lot of otherwise highly competent people advocate the NEGATIVE solution. But that is not actually a solution. It simply deals with the symptoms, and does not deal with the causes – the underlying MENTAL disease that afflicts the corrupt 'rulers'. Let me discuss the negative solutions first. What are these solutions? Imagine a malaria infested area near a stagnant pond. If you keep killing mosquitoes, or using half-open mosquito nets, or have people who WANT to be bitten by mosquitoes, then you CAN'T get rid of malaria. Mosquitoes bite AT NIGHT. They are INVISIBLE. You CAN'T KILL ALL THE MOSQUITOES INDIVIDUALLY. Similarly, the corrupt operate in INVISIBLE WAYS. They are blatant, but invisible. And there are LOTS AND LOTS OF THEM. What's the solution? Drain the pond. Make sure no mosquito can be born in the first place. You don't get malaria in the Sahara desert. Make sure you have a clean system. So what is positive solution? It is very simple. It has JUST ONE MAIN OBJECTIVE: to ensure that good people are EASILY able to enter politics and become 'rulers'. It is positive, because it ensures that mosquitoes can't get to breed in the first place. It doesn't go about fighting each of the MILLIONS OF MOSQUITOES. Such good people will of course REDUCE unnecessary government intervention, and get out of the way of the people. They will ensure liberty. If any of them applies socialist policy, then the swamp will come back again. If we get good people (NOT MOSQUITOES) what happens then? 1. The 'rulers' NEVER demand bribes. 2. The 'rulers' RAPIDLY PUNISH those who offer bribes (or take bribes, below them). And no one in the business world has any incentive to bribe (although that can't be ruled out – however such business people will be very scared once honest people become 'rulers'). GONE! Corruption gone! Over. Finis. The solution is therefore simple: ENSURE THAT GOOD PEOPLE CAN EASILY ENTER POLITICS AND BECOME 'RULERS'. 4. Pay the politicians VERY WELL. 5. Elect politicians who promote classical liberalism. People like me will find it worthwhile to contest elections and many such people will get elected. Today, people like me simply can't contest elections, because the system is designed to REWARD THE CORRUPT and THWART people like me. Once good people have got elected, they will automatically (without having 'fasts unto death') establish effective systems to catch and punish any residual mosquitoes – the corrupt, etc. That's when negative solutions can help. But today, just by focusing on negative solutions while ALL OUR POLITICIANS ARE 100% CORRUPT, corruption will never be removed. I support TI and indeed, all anti-corruption work. But I hadn't heard the fully story of TI till today when I chanced upon the following video (worth listening – 16 minutes). After listening to the video, do consider reading my comments, below. I thoroughly commend TI's founder Peter Eigen who is a true leader, a doer, not just a preacher or teacher. However, and this is an important point: TI's efforts have NOT been successful in removing corruption. That is a key point to note. It is like trying to fight malaria through a half-open mosquito net. Yes, some foreign aid projects or defence purchases by poor nations may no longer involve significant corruption on the surface, but these projects will be substituted by others that do allow corruption. So long as the Third World leaders WANT corrupt money, there is NOTHING that TI or anyone else can do to stop corruption. India is a WORLD WIDE HERO in corruption despite all TI efforts. So also China. The solution, I'd like to suggest to Peter (and to TI), is different. It involves promoting liberty across the Third World. It involves studying the detailed design of governance systems in the Third World and fixing the incentives that (today) ONLY allow the corrupt to rise to the top. In other words, BFN-type solutions will work, not TI-type solutions. I thought I'd publicly record my withdrawal of support of the IAC movement. I have been generally positive about them so far, but they seem to be a ONE TRICK PONY. They seem to imagine that by undertaking a series of hunger fasts, corruption will be removed from India. They imagine that by supporting a COWARD like Baba Ramdev that corruption will be removed from India (they still have a photo of this pathetic coward on their website). I've read a fair bit about the kinds of people whom they have collected as their leaders: many are socialists; others are rabid communal fanatics. A motley mix. The hallmark of these leaders is that NONE of these people have the courage to contest elections and change things the proper way – through the Parliament of India. Their "Jan Lok Pal" bill has ZERO prospect of reducing corruption (even if it were enacted, which is not going to happen, given it basically upturns all parliamentary powers). I have on numerous occasions pointed out to IAC (on its FB group, for instance) that they need to understand the CAUSES of corruption and address them. And that their methods must be political. They must fight elections and win – and change the laws. But they are determined to undermine democracy and give power to UNELECTED PEOPLE. 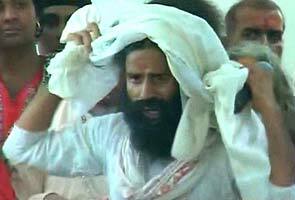 But it is their continued support of Ramdev that is the last straw. They must immediately distance themselves from this pathetic coward. 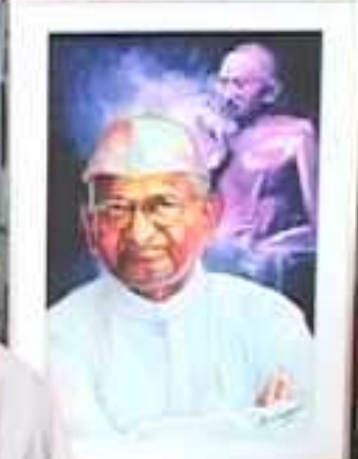 Further, it is OBNOXIOUS BEYOND IMAGINATION to have photos of Anna Hazare in the same frame as Mahatma Gandhi on the IAC website. There is simply NO comparison between the two. Hazare is a intellectually challenged man without a theory of society or theory of nation (he praised Narendra Modi, for instance, but more importantly has no systematic philosophy). At best he is a cheap copycat of Gandhi who doesn't know that Gandhi warned people against conducting fasts unto death. This man should be arrested and force-fed, not glorified. Let me end this post by clearly saying this: Anyone in India who believes he can resolve the issue of corruption should CONTEST ELECTIONS and get the PEOPLE'S MANDATE to change the laws, as appropriate. Please don't create anarchy. And stop associating with this cowardly fellow Ramdev. Let me also remind those who are GENUINELY interested in the removal of corruption that FTI is working towards this goal in a systematic manner, and if they are genuinely interested, they can join or otherwise support it. They can also read BFN to get an idea of how corruption (and poverty) can be eliminated. Indians are DELUDED if they think that the enactment of a Jan LokPal bill will clean India's image in the world. All the gloating and celebrating about this Bill won't budge corruption ONE BIT, because EVERYONE in the world knows that this Bill is a sham. The Bill doesn't deal with the fundamental DRIVERS of corruption. They know that just aping (and that too badly) a tiny part of Hong Kong's anti-corruption framework won't make the slightest dent in corruption in India. I therefore GUARANTEE (and I'm happy to be held to account on this guarantee) that the rankings of India on the Transparency International index won't budge even after five years of enacting this bill UNLESS the other reforms, clearly outlined in BFN, are implemented. Without very significant policy changes, corruption in India CAN'T be budged. The right policy changes CAN make a huge difference, within less than fives years. The Freedom Team is India that aims to deliver such fundamental reforms is India's ONLY HOPE. I encourage you to join/support FTI! Be not deluded by the enactment of trifles. The goal should be not just to stop the generation of corruption but to create high quality education for everyone, and freedom to trade and produce. Not ONE party (or the India Against Corruption movement) understands what it will take to move India in the right direction. The future of India is being compromised by bad policies. Corruption is just one of the many reasons why India is losing its attraction as an investment destination. The package we offer to investors is decidedly unattractive – blocking them at every step. Just for the record, I'd like to copy most of this article from The Economist, for wider dissemination. CORRUPTION is dreadful in India, as shown by a current “season of scams”—over mobile-phone licences, the Commonwealth games and more. Politicians, notably the ruling Congress party, are now feeling the public’s ire (see article). Worries have also grown that graft is scaring away foreign businesses. Circumstantial evidence points that way. A spokesman for a big Western firm mutters into his cappuccino about a recent High Court decision, which if upheld would cost his company billions. It was so strange, he says, it could be explained only by judicial graft. A representative of a British media firm, SIS Live, which broadcast the Commonwealth games from Delhi, in October, is furious—along with other contractors—at being left millions of pounds out of pocket because, he says, payments have been frozen by investigators digging up evidence of corruption at the event. Across the board, surveys regularly tell how graft is an unusually heavy tax on Indian business. An annual one published on March 23rd by PERC, a Shanghai-based consultancy, shows investors are more negative than they were five years ago. Of 16 mostly Asian countries assessed, India now ranks the fourth-most-corrupt, in the eyes of 1,725 businessmen questioned. Being considered worse than China or Vietnam is bad enough; being lumped with the likes of Cambodia looks embarrassing. Outsiders may get an exaggerated view. India’s democracy, with a nosy press and opposition, helps to trumpet its scams and scandals, more than happens in, say, China. Yet locals tell similar tales. A cabinet minister frets that there is so much ghotala (fiddling), “it tells the world we are all corrupt. It may be a dampener to investment.” Others agree. KPMG this month reported on 100 bosses who were asked about their own experience of graft. One in three said it did deter long-term investment. Judging how much difference it makes is tricky. Right now, investors may be spooked as much by the fight against graft as by the corruption itself. Arpinder Singh of Ernst & Young in Mumbai says foreigners, especially those with some connection to America, increasingly hire firms like his to help them comply with America’s Foreign Corrupt Practices Act. Once a foreigner holds more than about 5-10% equity in an Indian firm, it is seen as having some responsibility for how it is run. Now even Indian firms, if they want to raise money abroad, or if their bosses want to protect their own professional reputations, are doing the same. As other countries, such as Britain, bring in tough anti-graft laws like America’s, the trend will continue. Yet many Indian firms still fail to comply with higher standards, so deals falter. Mr Singh ticks off a list, “in infrastructure, ports, toll roads, irrigation, microfinance”, of deals he has worked on that collapsed over “governance problems”. None of this is enough to prove that graft, alone, is scaring off business. Pranab Mukherjee, the finance minister, insists there is no correlation between corruption and foreign direct investment (FDI). But something is keeping investors wary. In 2010 the country drew just $24 billion in FDI, down by nearly a third on the year before, and barely a quarter of China’s tally. There is no shortage of other discouragements: high inflation, bureaucracy, disputes over land ownership, and limits on foreign ownership in some industries. Even so, India is home to an unusually pernicious form of corruption, argues Jahangir Aziz of JPMorgan. Elsewhere graft may be a fairly efficient way to do business: investors who pay bribes in China may at least be confident of what they will get in return. In India, however, too many crooked officials demand cash but fail to deliver their side of the bargain. Uncertainty, not just the cost of the “graft tax”, may be the biggest deterrent of all.